It shouldn't come as much of a surprise that you can fit a Tegra 2 in your pocket -- how else could we have these phones? -- but it's still impressive to see the dual-core ARM Cortex A9 and GeForce ULP chip find its way into a bona fide fanless nettop that sips just three watts under load. 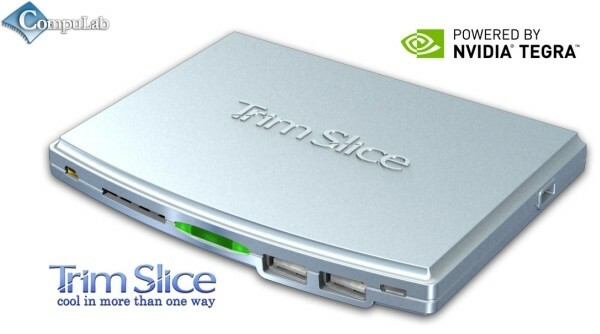 This Compulab Trim Slice isn't nearly as powerful as the AMD Fusion model we saw last week, but it sure is svelte, with a die-cast metal case just six-tenths of an inch thick despite cramming in a SATA SSD, 1GB of RAM and most every I/O port you could want. You're looking at four USB 2.0 sockets, SD and microSD slots, HDMI, DVI, RS-232, Gigabit Ethernet, 802.11n WiFi and Bluetooth, a pair of 3.5mm audio jacks and S/PDIF out for sound, not to mention JTAG, UART and SPI interfaces for extending the system on your own terms -- and analog video-in, for crying out loud. Look for it in April, priced "higher than a streamer, but lower than a tablet." Sound about right? Find another picture and the full PR after the break, while you make up your mind. Compulab makes a tiny Tegra 2 computer for the lilliputian community originally appeared on Engadget on Tue, 25 Jan 2011 23:51:00 EDT. Please see our terms for use of feeds.